Cite this article as: Yersal O, Meydan N, Barutca S. Spontaneous Resolutıon of Stauffer’s Syndrome in Advanced Renal Cell Carcınoma: A Case Report. Ann Clin Case Rep. 2016; 1: 1211. Stauffer syndrome is characterized by abnormal liver function tests, hepato-splenomegaly, histologic changes consistent with non-specific hepatitis, and recovery of these abnormalities after nephrectomy, in patients with RCC. Few cases have been described with paraneoplastic cholestatic jaundance of RCC in the literature. We report a case of a female patient presenting with advanced renal cell carcinoma with Stauffer’s syndrome who has recovered spontaneously. Renal Cell Carcinoma (RCC) is associated with an up to 10% to 40% prevalence of paraneoplastic syndromes either at the time of diagnosis or during the disease course. Hypercalcemia, hypertension, polycythemia, nonmetastatic hepatic dysfunction, galactorrhoea, Cushing's syndrome, alterations in glucose metabolism, amyloidosis, anemia, neuromyopathy, vasculopathy, nephropathy, coagulopathy and prostaglandin elevation are paraneoplastic manifestations, that has been described among RCC patients . In 1961, Stauffer described abnormal liver function tests, hepato-splenomegaly, histologic changes consistent with non-specific hepatitis, and recovery of these abnormalities after nephrectomy, in patients with RCC . Cytokin production by the tumor, especially interleukin 6 are considered as the underlying pathogenetic mechanism of RCC patients who present with hepatic dysfunction in the absence of liver metastases. We report a case of an female patient presenting with advanced renal cell carcinoma with Stauffer’s syndrome who has recovered spontaneously. A 69 year old female patient was admitted with jaundance and pruritis of two weeks duration. She had a history of right radical nephrectomy nineteen years before and the final pathologic examination had demonstrated clear cell carcinoma with renal vein invasion. Follow up magnetic resonance imaging confirmed a left renal mass of 7 cm, thirteen years after operation. The patient refused surgery and any medical treatment and was on radiologic follow up. However, after a follow-up period of two years, renal mass increased in size and she developed a second renal 5 cm mass. She received interferon-alpha therapy until radiologic evidence of disease progression for three months. Sorafenib was administered as second line treatment which was discontinued by the patient because of severe skin reactions, while the disease regressed. She again denied treatment and lost from follow up. Physical examination revealed jaundence, hepatomegaly and a large palpable, relatively mobile, nontender mass in the left side of the abdomen. Laboratory data revealed anemia leucocytosis, elevated alkaline phospatase (ALP), gamma-glutamyl transpeptidase (GGT), total billurubin, calcium, decreased serum albumin levels and prolonged prothrombine time (Table 1). Protein electrophoresis revealed mild diffuse hyperglobulinaemia. She was negative for hepatitis A,B,C,D, cytomegalovirus, Epstein-Barr virus, herpes virus serological tests. Immunological assays for the various autoimmune diseases (ANA, ENA, antids DNA, antiss DNA, antihistones antibodies, ASMA, AMA, p-ANCA, c-ANCA) were all negative. The urine analysis showed hematuria, blood and urine cultures were sterile. Abdominal ultrasonography showed 94 and 75 mm masses on the left kidney. There was no evidence of intrahepatic or extrahepatic biliary dilatation. Abdomen computed tomography showed two masses on left kidney and multipl paraaortic lymphadenopathies (Figure 1). MRCP revealed normal pancreas and no intra or extrahepatic biliary dilatation. The patient's liver function test levels gradually increased reaching the highest values one month from admission (Table 1). The patient denied liver biopsy and only treated with cholestyramine supportively. On follow up billurubin, ALP and GGT levels gradually decreased and became in normal ranges 3 months later without any therapy (Table 1). She is on follow up without any treatment for one year and her billurubin level is in normal ranges. Abdomen computed tomography showing two masses on left kidney. Malignancy related cholestasis is usually associated with mechanichal obstruction of biliary tract or widespread hepatic metastasis. It can rarely be the paraneoplastic manifestation of some malignancies; especially renal cell carcinoma . Few cases have been described with paraneoplastic cholestatic jaundance of RCC in the literature . Our patient had elevated ALP, GGT and billurubin levels, decreased albumin and prolonged prothrombin time. There was no liver abnormality on abdomen computed tomography. On the basis of these findings and absence of obvious cause of liver dysfunction the patient diagnosed as having Stauffer’s syndrome. Stauffer’s syndrome with cholestatic jaundence, appears as the initial clinical presentation of renal cell carcinoma. All described patients were diagnosed during an evulation of jaundence . They all underwent nephrectomy and had complete resolution of clinical and liver function abnormalities after surgery. Recently, Girotra et al reported a patient with prior nephrectomy who developed Stauffer’s syndrome as a presentation of RCC recurrence . The patient denied further workup and there is no information about clinical course thereafter. Authors concluded that this syndrome may be a surrogate marker of RCC recurrence. Our patient had prior nephrectomy for RCC and she had developed a mass on the other kidney on follow up. Stauffer’s syndrome diagnosis was not obtained neither prior the diagnosis of RCC nor before recurrence. Jaundence occurred after disease recurrence when she was not taking any medications for RCC. She was icteric on admission, billurubin levels tend to decrease and became normal levels 3 months after. Resolution of Stauffer’s syndrome was spontaneously as she did not accept operation and any other medication for RCC. The underlying pathophysiology of this paraneoplastic manifestation is poorly understood. However possible role of IL-6 overexpression by the primary tumor are reported. Blay et al. investigated this issue in 119 metastatic renal cell carcinoma patients and found that patients with detectable IL-6 had significantly higher serum ALP and GGT levels. They concluded that IL-6 is involved in the pathophysiology of paraneoplastic cholestasis. 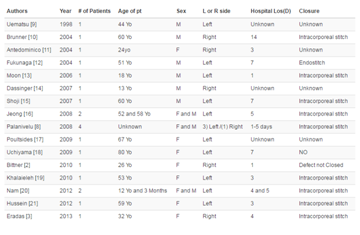 Think that our case adds to the growing pool of data of this rare variant of Stauffer’s syndrome. There is no data about non treated paraneoplastic cholestatic jaundence of RCC in the literature. This is the first case of spontaneous resolution of this paraneoplastic syndrome. Palapattu SG, Kristo B, Rajfer J. Paraneoplastic Syndromes in Urologic Malignancy: The Many Faces of Renal Cell Carcinoma. Rev Urol. 2002; 4: 163-170. Stauffer MH. Nephrogenic hepatosplenomegaly. Gastroenterology. 196; 40: 694. Gold P, Fefer A, Thompson J. Paraneoplastic manifestations of renal cell carcinoma. Semin Urol Oncol. 1996; 14: 216-222. Dourakis SP, Sinani C, Deutsch M. Cholestatic jaundice as a paraneoplastic manifestation of renal cell carcinoma. Eur J Gastroenterol Hepatol. 1997; 9: 311-314. Giannakos G, Papanicolaou X, Trafalis D. Stauffer’s syndrome variant associated with renal cell carcinoma. Int J Urol. 2005; 12: 757-759. Girotra M, Abraham RR, Pahwa M, Arora M. ANZ Journal of Surgery. 2010; 80: 949-950. Blay JY, Rossi JF, Wijdenes J. Role of IL-6 in paraneoplastic inflammatory syndrome associated with renal cell carcinoma. Int J Cancer. 1997; 72: 424- 30.